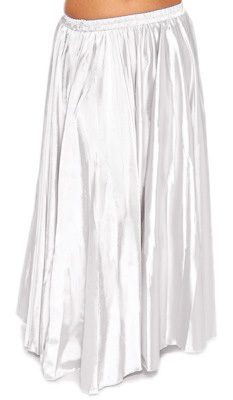 Shimmering, glamorous, and comfortable, this full circle white satin skirt is suitable for all styles of belly dance. A perfect staple for your belly dance costume wardrobe! Made of soft polyester. this skirt is very shimmery and spins nicely. It is very long. Had to hem about 4 inches. i'm 5'4"
This skirt is great, shinny material and plenty of yardage to swing around.